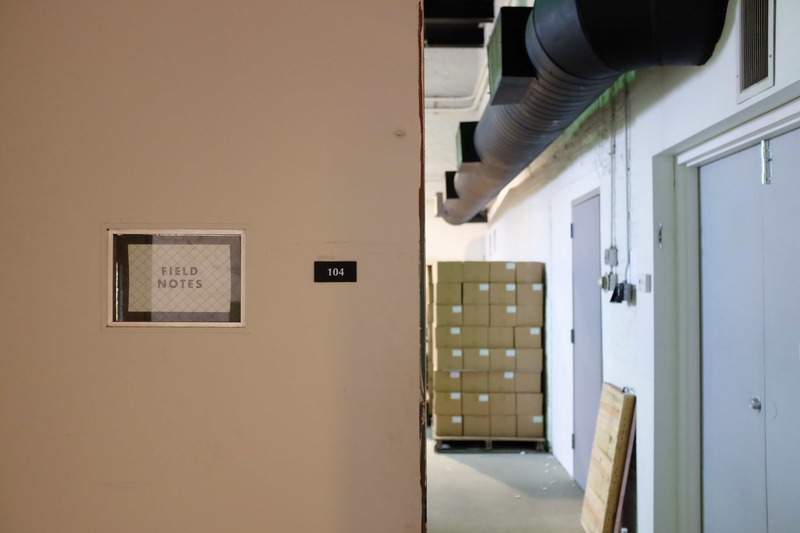 Visiting Field Notes Brand’s headquarters is a little odd at first, but also a little like what you might imagine the brand’s offices to be like. 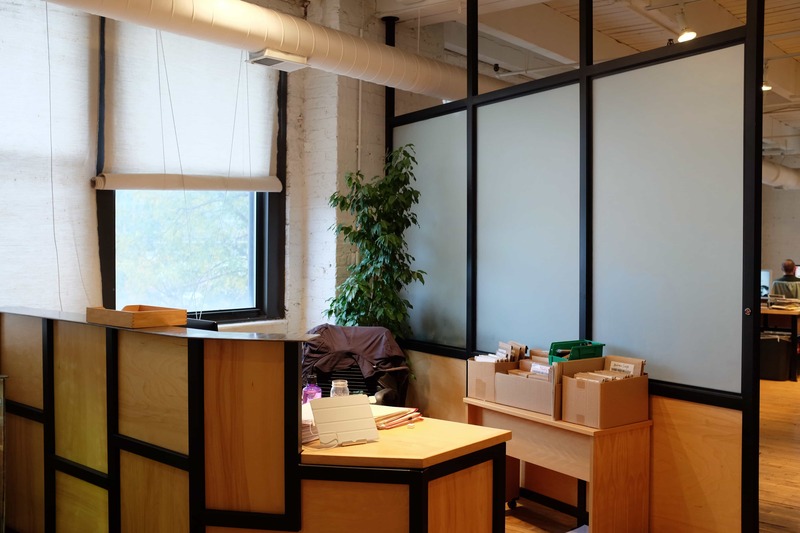 Located in Chicago’s meatpacking district a couple blocks out from Fulton Market, the largely unmarked building almost convinces you that you’ve got the wrong place. But you don’t. Once buzzed inside and up the three flights of stairs things seem much more in-place. 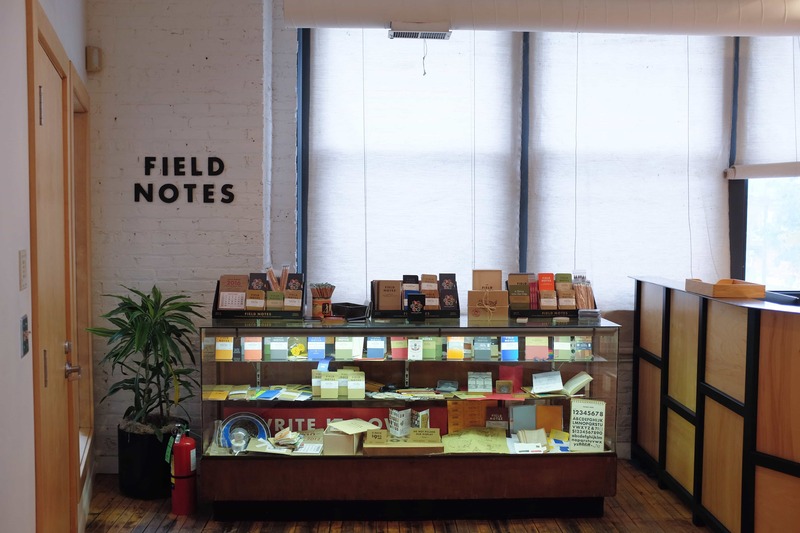 Right inside the front door you’ll feast your eyes upon Field Notes’ miniature museum – with all 28 Colors editions (29 now) proudly on display alongside a host of other brand memorabilia. No pillaging allowed here. 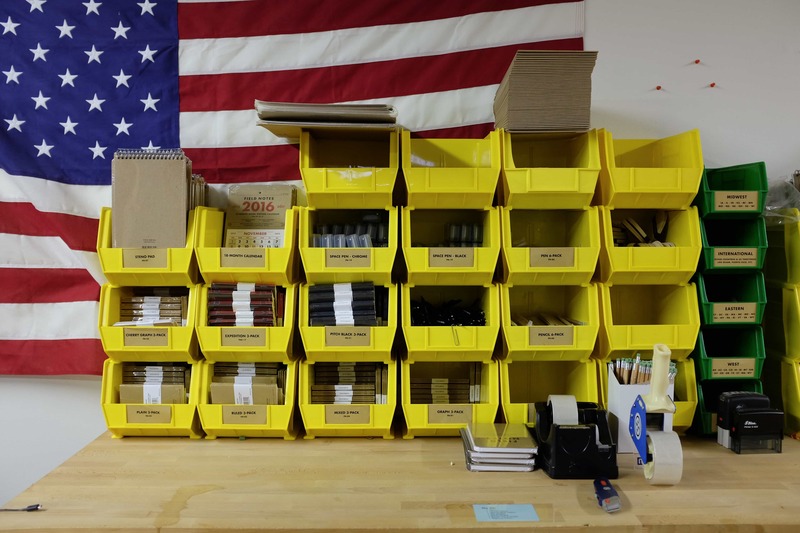 Upon my visit I met with Bryan Bedell who handles design and manufacturing for Field Notes. 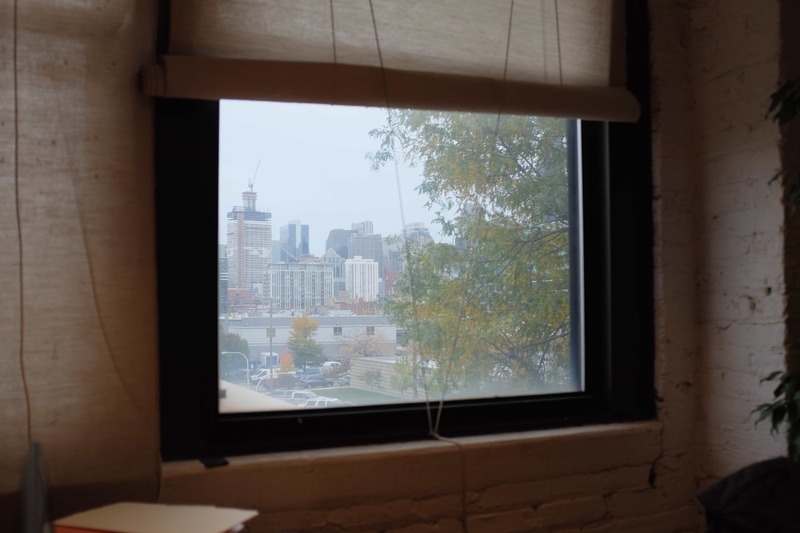 He showed me around their space, shared some great stories and details about the goings-on there, and let me snap some photos for the Tools & Toys readers – yourself included. Past the main entrance and museum where I met Bryan is where you’ll run into the brand’s main office spaces. Conference rooms and a kitchen to the right, and a more open desk area to the left – including Jim Coudal’s himself. 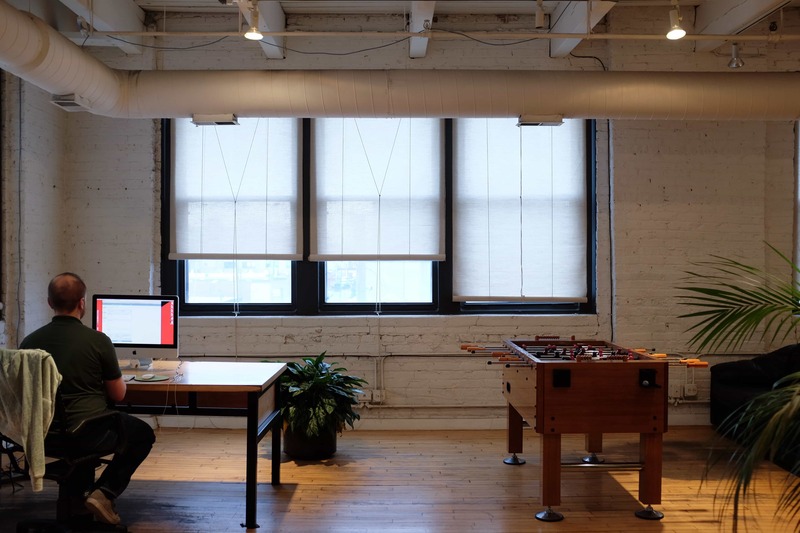 These areas are nice, with the trappings that one might expect from a modern startup. 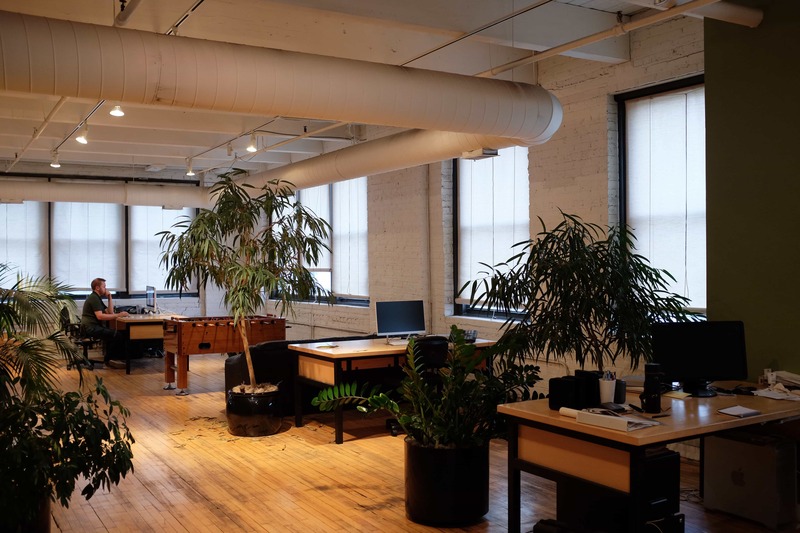 An open floorplan, green plants, lots of natural light, and even a foosball table. Judging by the furnishings it seems like a really nice place to work, but it isn’t necessarily magical in the way that I and other Field Notes fans might assume. 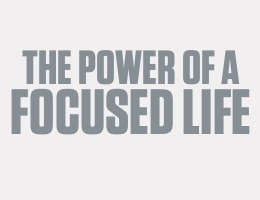 Thankfully, the magic is there in heaps – you just have to go a little deeper. 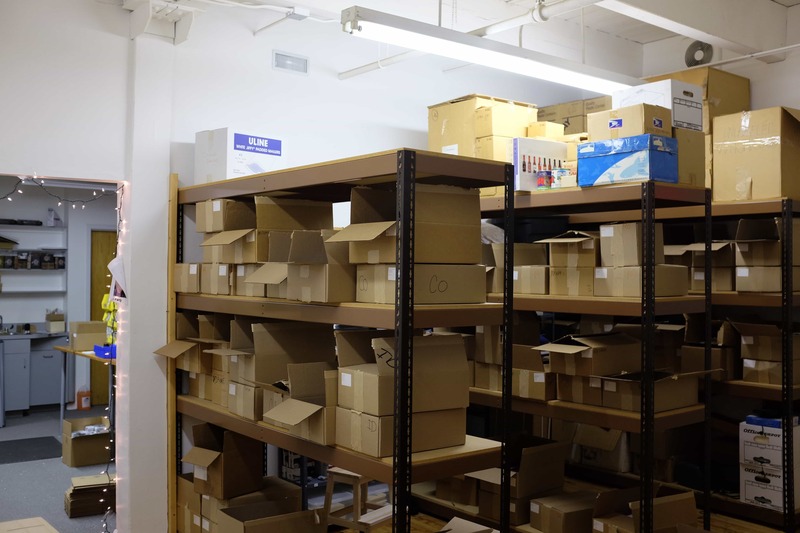 After winding back through the main hallways you’ll come through the first stock room of shelves piled high with boxes of books. “Mostly stock for all the different County Fair editions” Bryan says. Pass a picture of a mullet-ed gentleman in the doorway labeled “business” the way you’re coming from and “party” the direction you’re walking, and you’ve entered the packing room. You’ve arrived. All around you upon your entrance are the various packing stations. 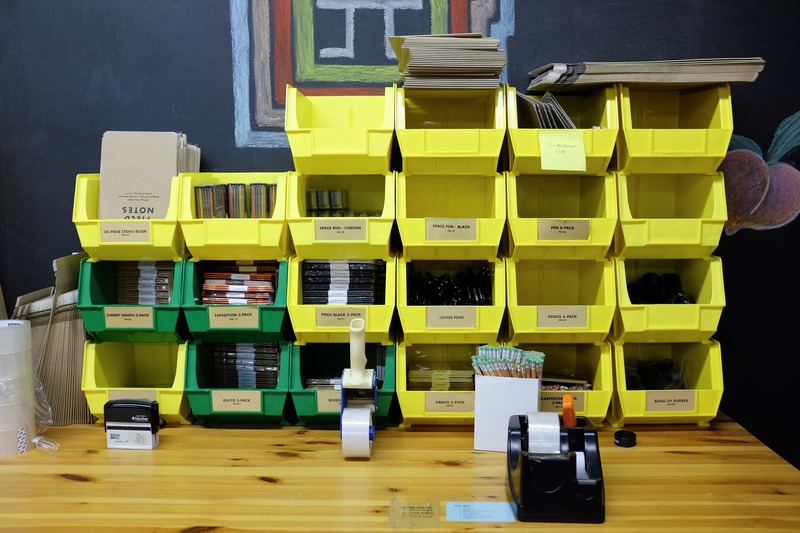 Each one is made up of bins holding the brand’s current products, and they’re designed in such a way that makes it easy to grab the various items for a specific customer’s order. 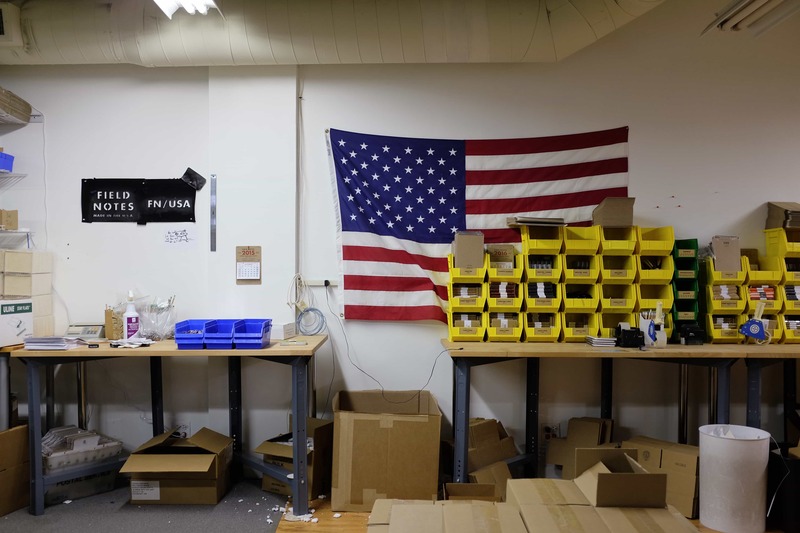 Down at the other end of the room, past the large American flag draped across two of the packing stations, are various stacks of boxes – each containing a variation of the currently shipping books. 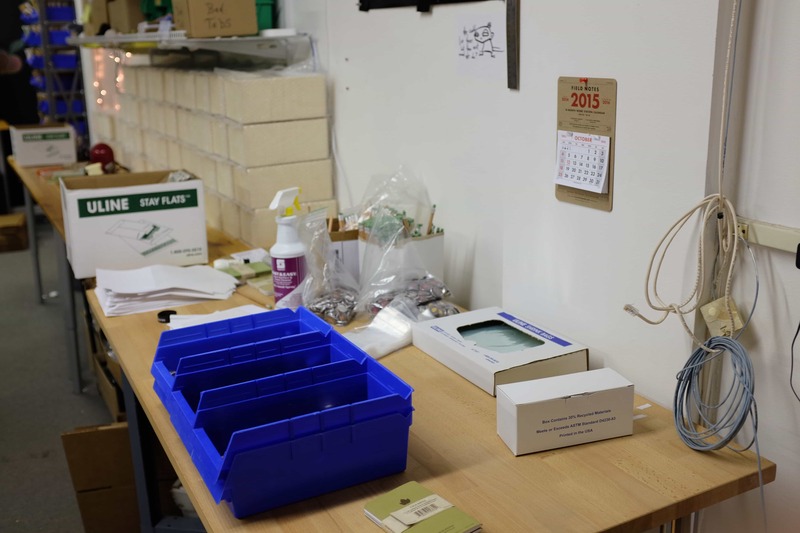 The packing room is where every Field Notes in the world is processed, made-up and then sent out. It bears all the little organic details that make it seem magical – much like the Field Notes books themselves. 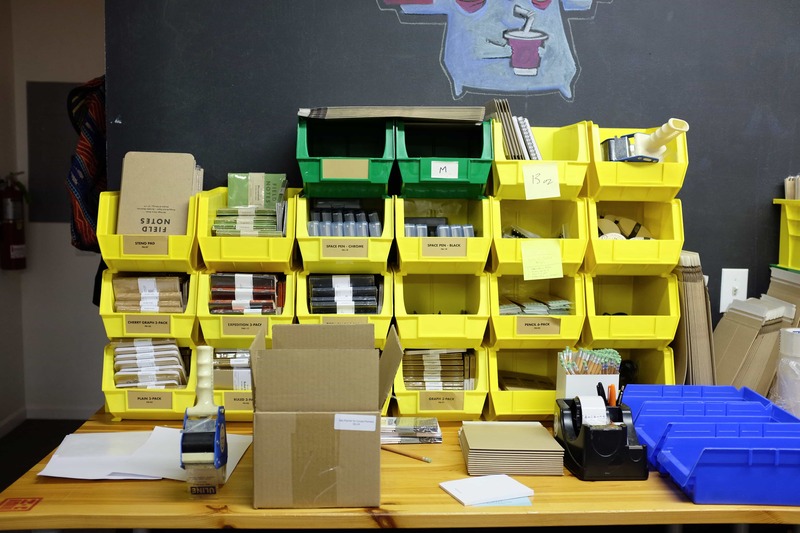 The chalk drawings on the wall, the odd pre-production memo book you’ll find lying around, and the different stacks of boxes with their hand-written labels. 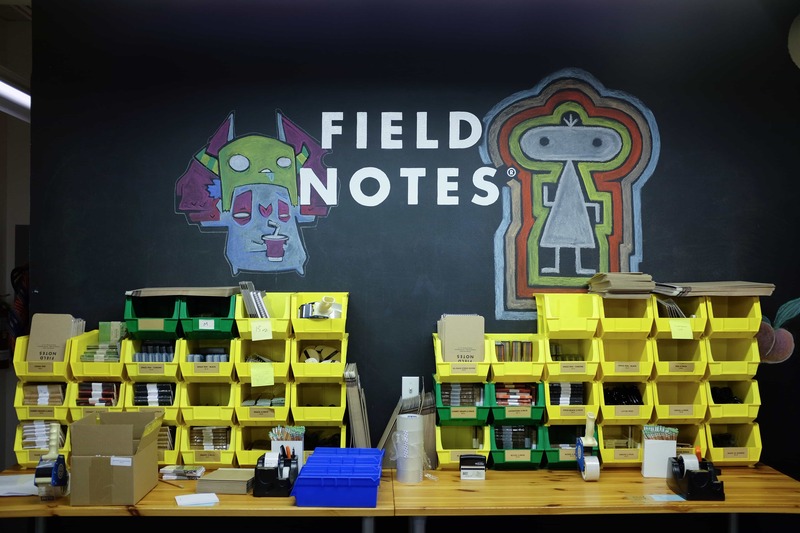 It’s all delightful, and while it’s no pristine assembly line, I think it better speaks to the spirit that makes Field Notes great. It’s not perfectly exact, or pretentious, or pristine. It’s unique, sometimes a little messy, and absolutely brilliant in it’s own right. 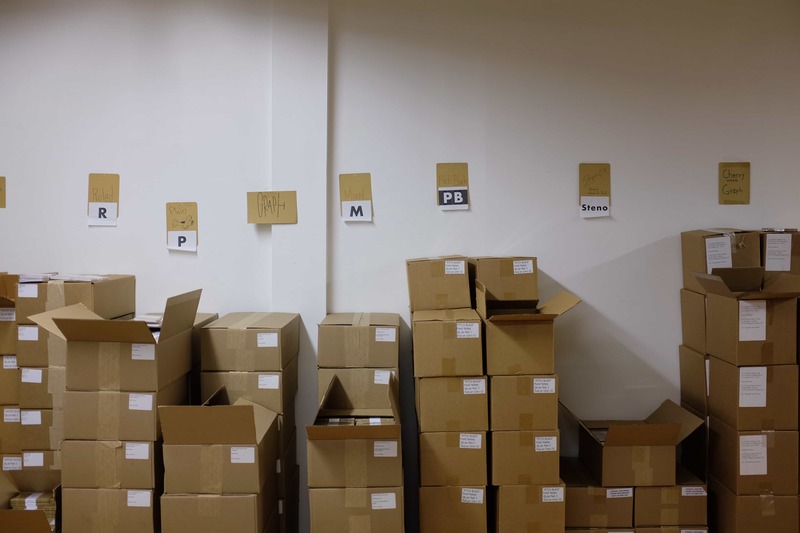 Even further downstairs is a larger store-room with even larger boxes of books waiting to be shipped out, but after making the final trek down and then back upstairs again the tour is largely over. The experience on the whole secures the notion that it’s a great thing that Field Notes Brand has going on here. 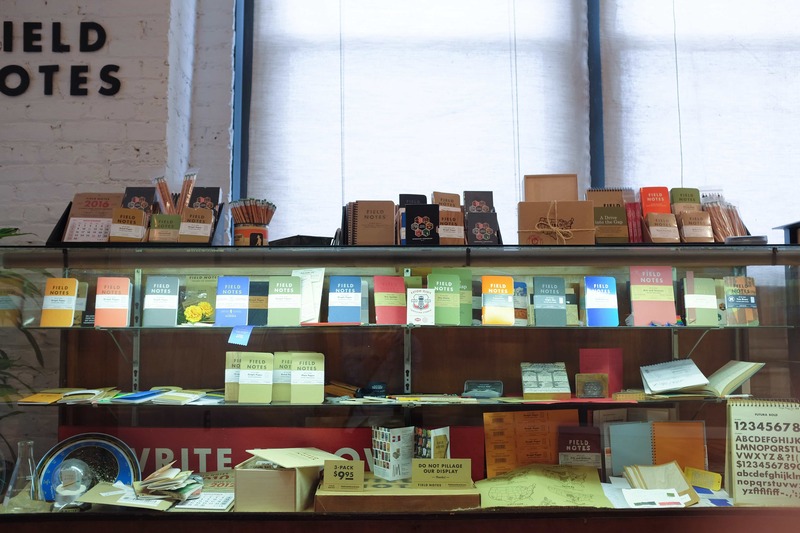 It’s a small little place, sending out a very large number of little books that make very many people happy. To accomplish that with such a small team of people – 6 on an average day, and only around double that on the brand’s big announcement occasions – takes a little magic. 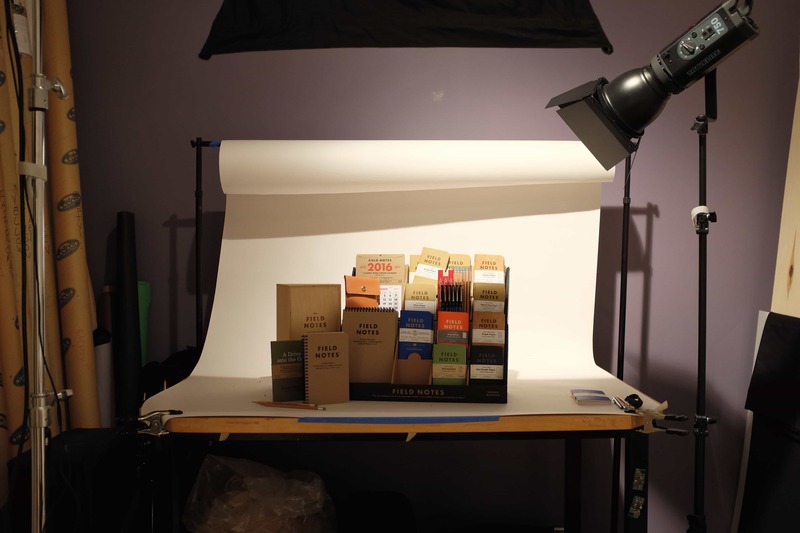 And from Field Notes HQ’s understated location, to the sheer number of books they ship, and even more importantly the obvious amount of care that goes into the products, it’s clear there’s more than a little magic and creativity in the air.